The Ichimonji School (一文字) in Bizen Province was a large school that was founded in the beginning of the Kamakura period and lasted through the Nanbokucho period. From the beginning of the Kamakura period and up until the middle of the Kamakura period, works by this school are commonly referred to as Ko-Ichimonji (古一文字) works. From the beginning of the Kamakura period and through the middle of the Kamakura period, the center of the production done by this school was located in the area called Fukuoka (福岡). From the end of the Kamakura period and through the early part of the Nanbokucho period, the center of production moved to Yoshioka (吉岡). Around the Shochu era (1324-1326) another branch of the Ichimonji school sprang up in Iwato (岩戸) in Bizen. This branch is called the Iwato Ichimonji (岩戸一文字). Since it was most active around the Shochu (正中) era, it is also called the Shochu Ichimonji school (正中一文字). Around 1225 Norifusa is said to have founded Katayama Ichimonji school (片山一文字) when he moved to Katayama from Fukuoka. The Ichimonji school branched out around the end of the Kamakura Era when Fukuoka Ichimonji smiths such as Sukeyoshi (助吉) moved to Yoshioka in Bizen Province. Because of this move they thrived much longer than did the Fukuoka Ichimonji smiths and the Yoshioka school continued to flourish well into the Nanbokucho Era. 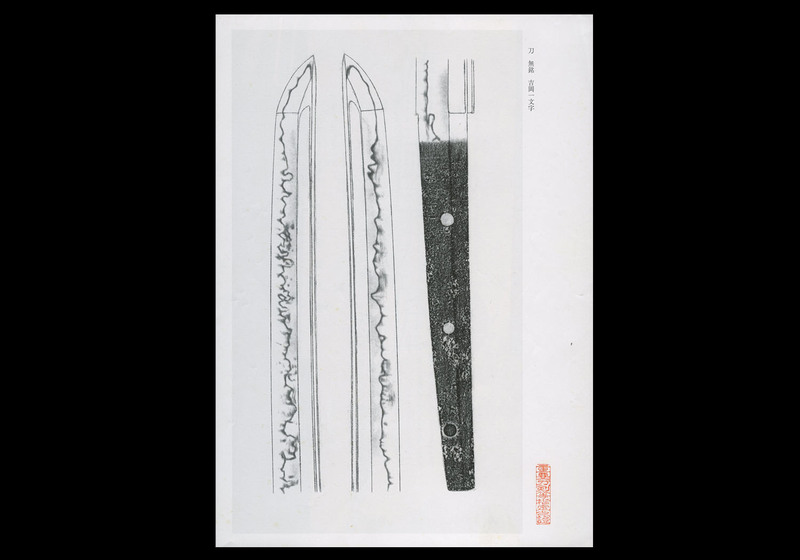 The swords of the Yoshioka Ichimonji School (吉岡一文字) show workmanship that is magnificent and flamboyant. They followed the fashion of the period in terms of their shape and sugata. 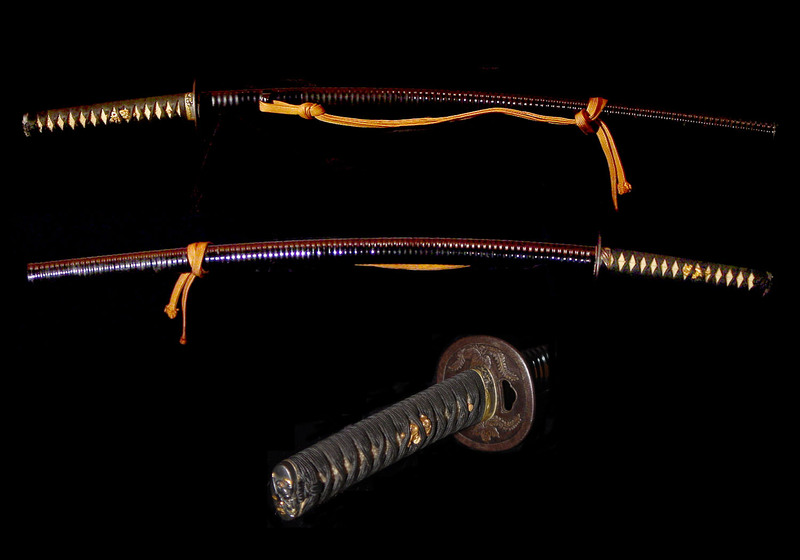 This Yoshioka katana is a perfect example of these magnificent swords. For more information about the Yoshioka and other Ichimonji schools, please visit the Ichimonji article in our articles section. 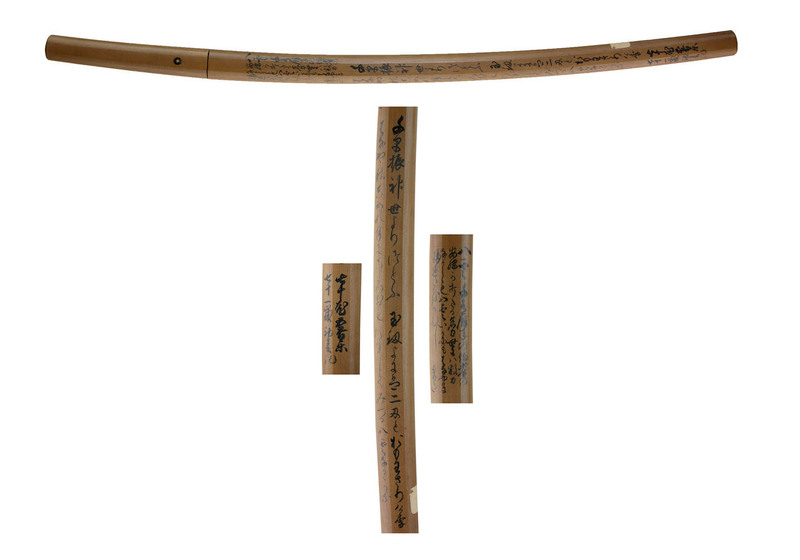 Katana, Unsigned: Yoshioka Ichimonji (吉岡一文字). Measurements: Length: 67.3 cent. ; Curvature: 1.6; Width at Base: 2.8 cent. ; Width at the Point: 1.9 cent. 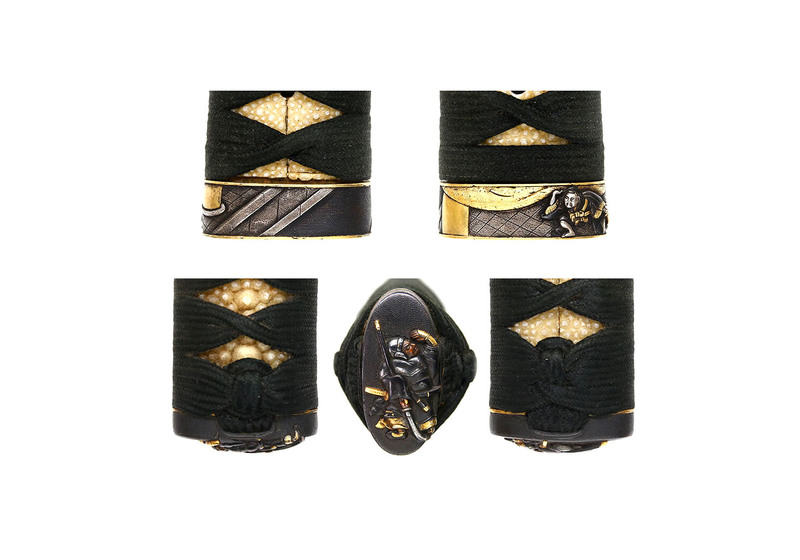 ; Kissaki Length: 3.1 cent. 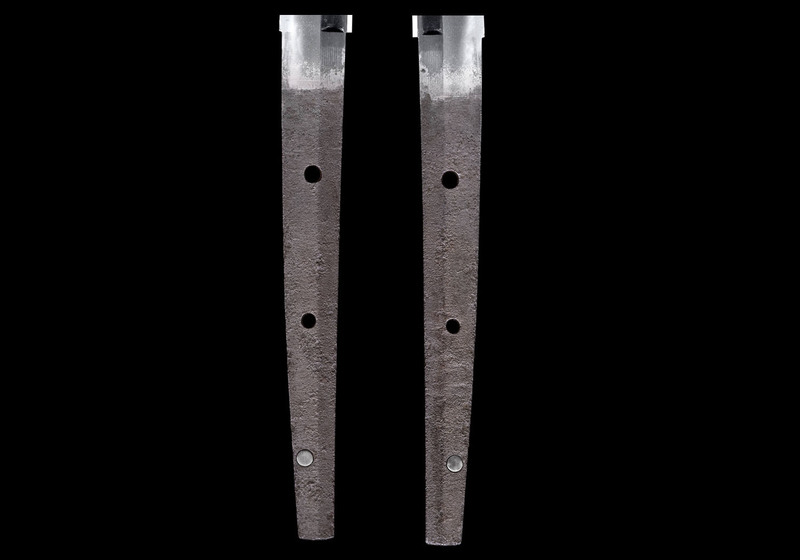 ;Nakago Length: 20.8 cent. ; Nakago Curvature: none. Characteristics: The construction is shinogi-zukuri with a mitsu-mune. 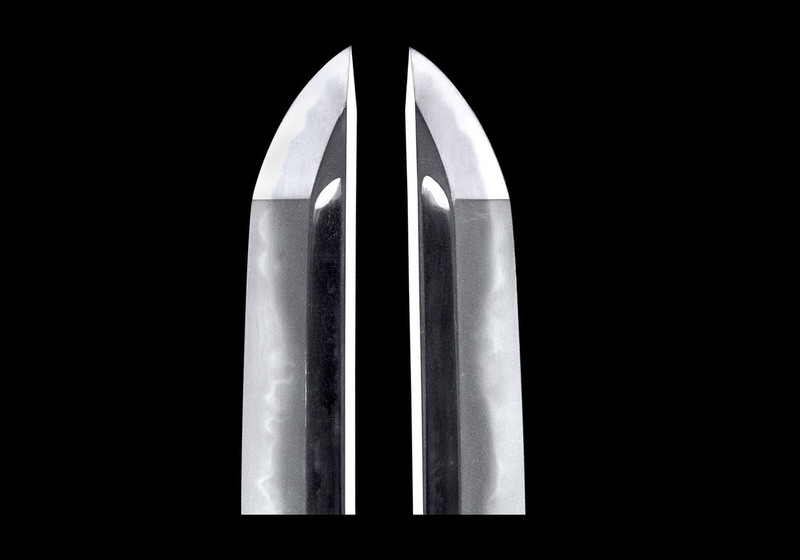 The blade is wide, and there is slight difference in the width between the base of the blade and the point. 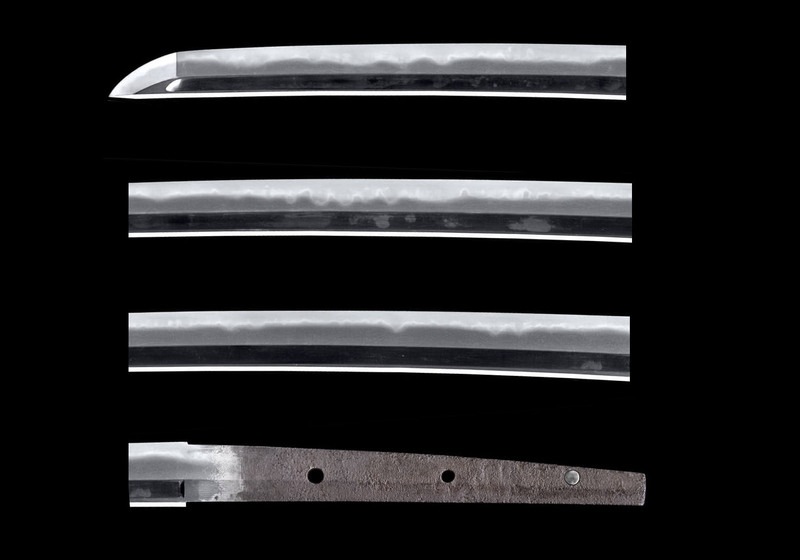 The blade is somewhat thin, and the curvature is shallow. There is a chû-kissaki. 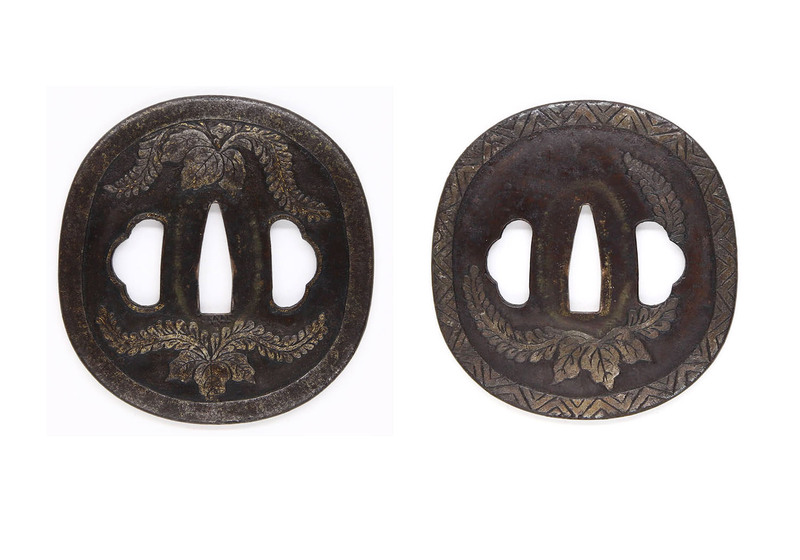 The kitae is itame that is entirely flowing with a prominent hada pattern that is covered in ji-nie. 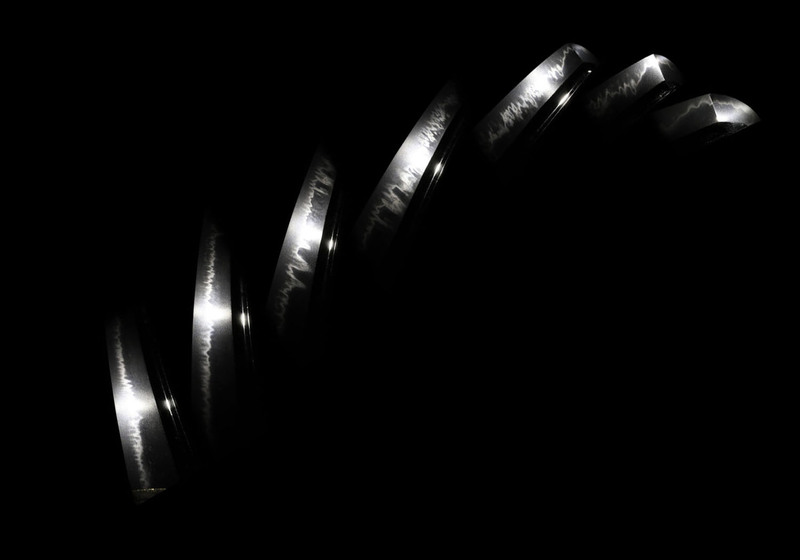 There is prominently distinctive midare-utsuri. 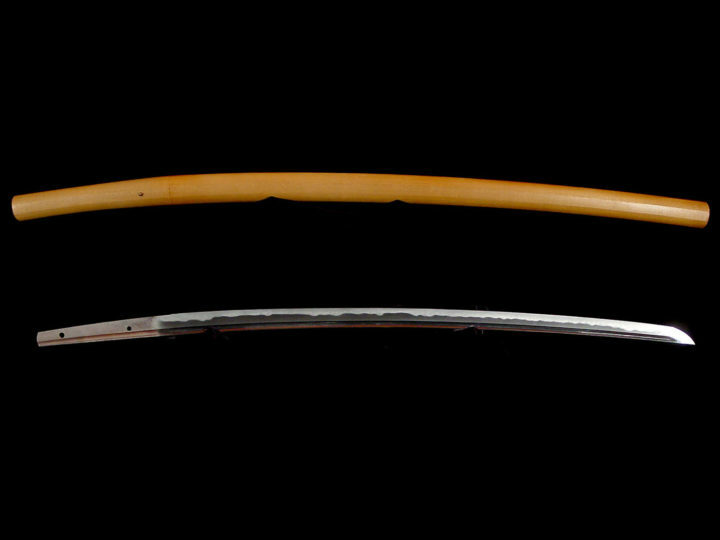 The hamon is chôji and ko-chôji with a mixing in of togari-like ha. 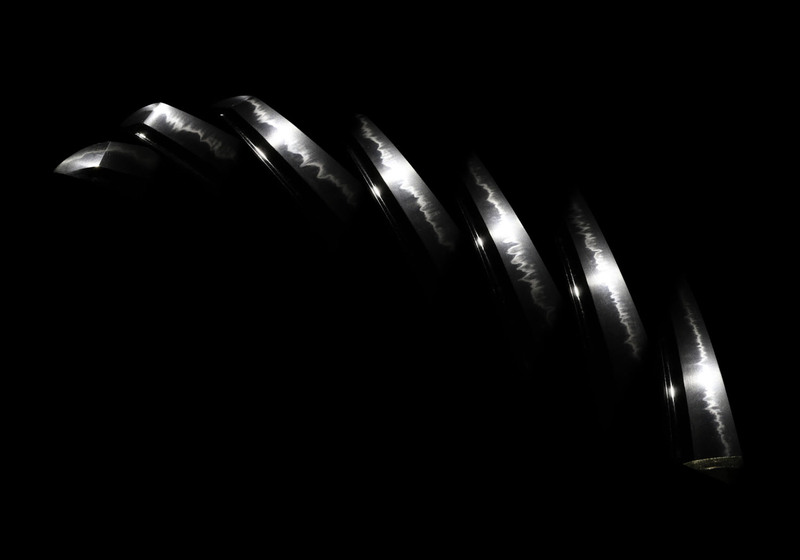 Undulations can be seen in the tempering, and there is a great deal of ashi and yô activity. The habuchi is nioi based, and there are streaks of sunagashi here and there. The nioiguchi is bright. The bôshi is midare-komi with a slightly pointed tip and kaeri. There are square-ended bôhi carvings on both sides of the blade. The nakago is ô-suriage with as slightly kurijiri end, and the yasurime are kiri. There are three mekugi-ana, of which one is filled. The blade is unsigned. Explanation: The greatest number of Bizen works produced during the Kamakura period are from the two schools of the Ichimonji and Osafune, and, with the Ichimonji School, thereafter into the Nambokuchô period in such places as Fukuoka (福岡), Yoshioka (吉岡) and Iwato (岩戸), they prospered with a great number of excellent sword-smiths appearing one after another. 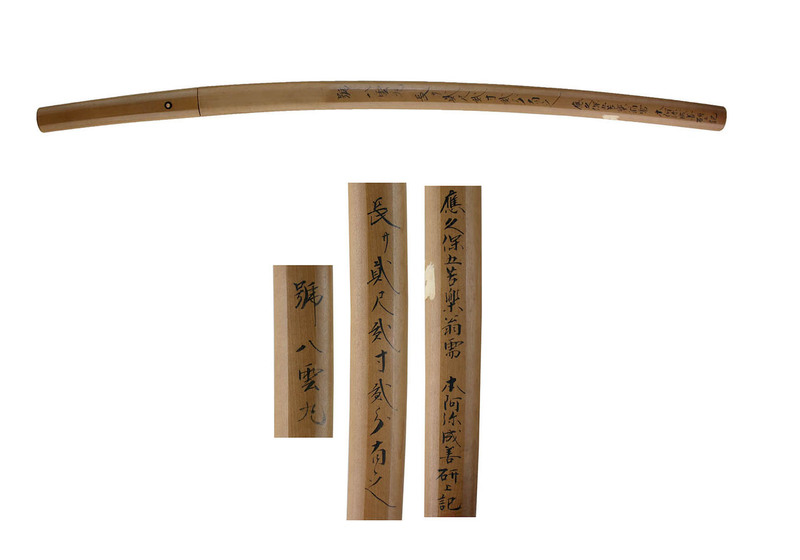 As for the reason why this school is called the Ichimonji, they engraved the character “Ichi” on the nakago, and there are works on which the character “Ichi” is engraved alone, or, below the character “Ichi,” they also engraved their individual names, or, they only engraved their individual names. 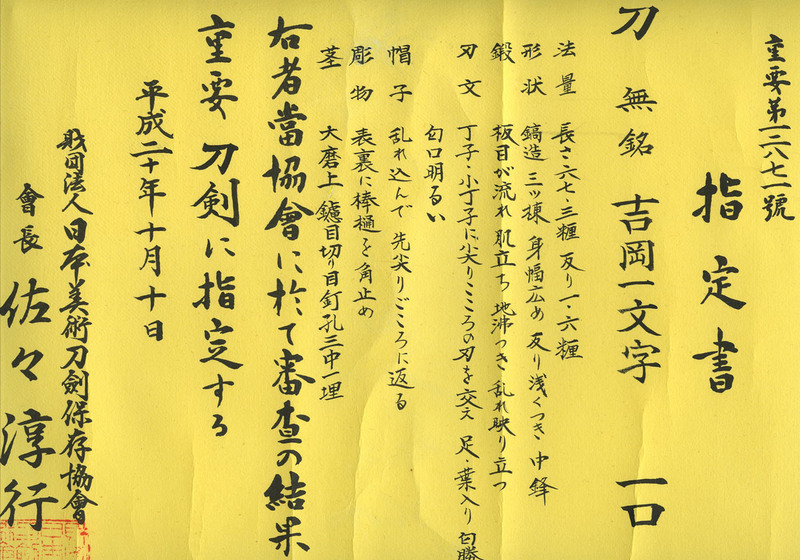 Regarding the Yoshioka Ichimonji School, they followed the Fukuoka Ichimonji School, and prospered during the late Kamakura period into the Nambokuchô period. The representative smiths in the school are Sukemitsu (助光), Sukeyoshi (助吉), Sukeshige (助茂), Suketsugu (助次) and Sukeyoshi (助義) with the character “Suke” heading their signatures. 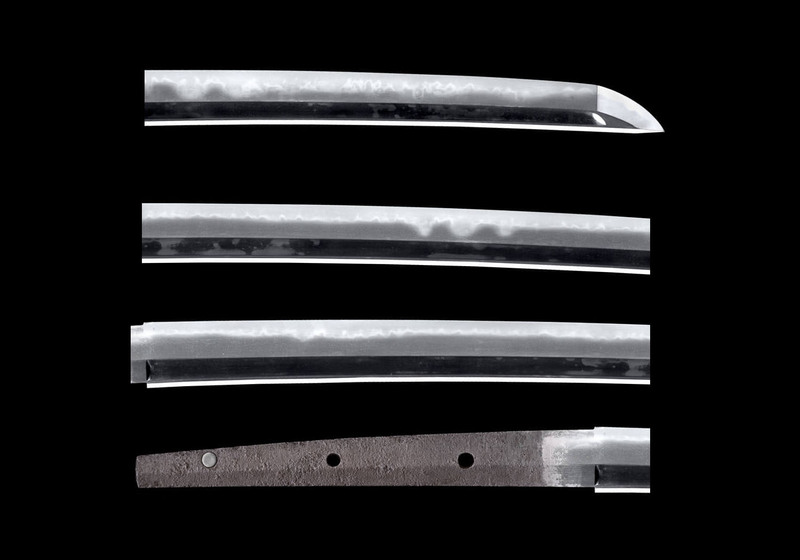 Regarding their style of workmanship, one can rarely see the kind of large patterned midare-ba reminiscent of the Fukuoka Ichimonji School; however, in general, within their midare-ba, there is conspicuous gunome, and a rather small patterned style of workmanship is typical. 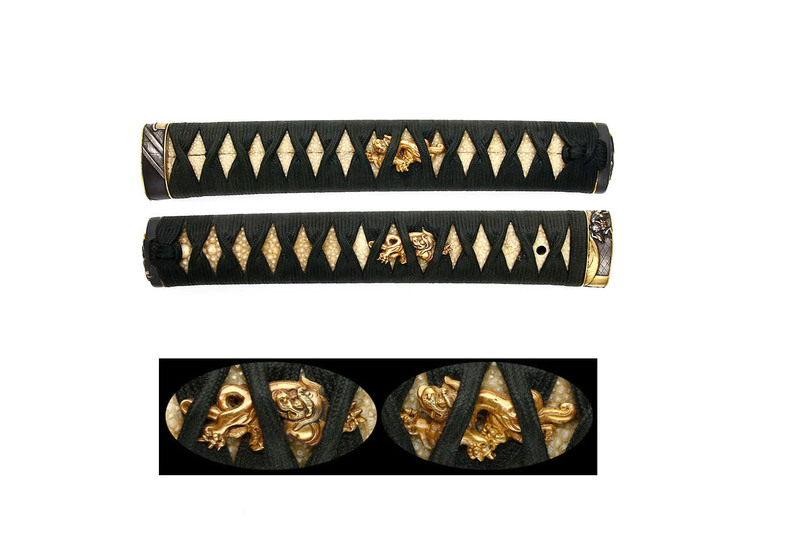 As for this sword, the itame is entirely flowing with a prominent hada pattern that is covered in ji-nie, and there is prominently distinctive midare-utsuri. 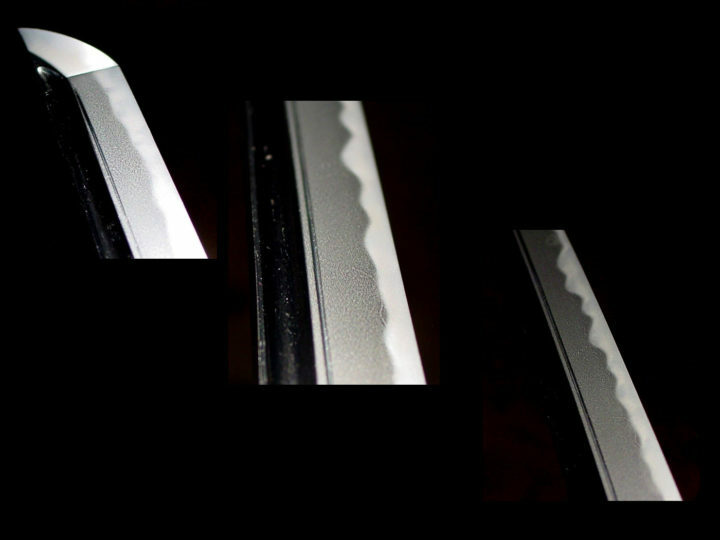 The hamon is chôji and ko-chôji with a mixing in of togari-like ha, and undulations can be seen in the tempering. There is a great deal of ashi and yô activity, and the nioiguchi is bright, all of which are the characteristics of this work. 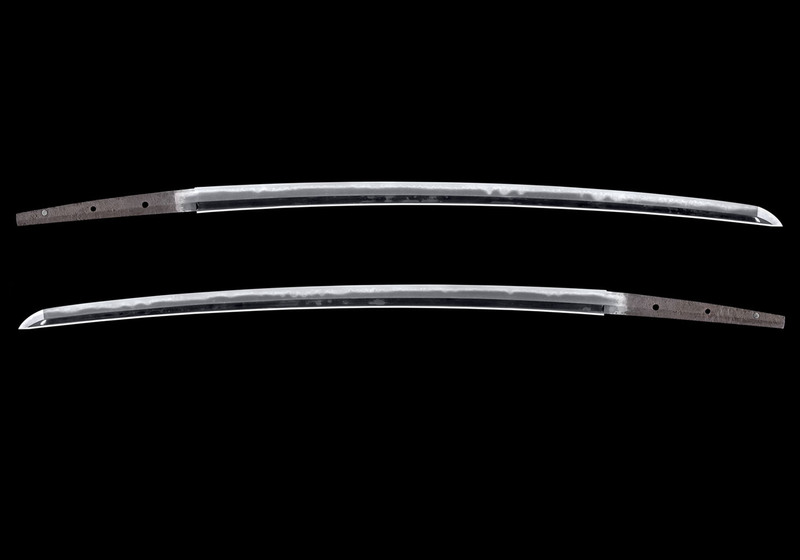 Regarding the hamon, it is an entirely active midare-ba, and there is a great deal of ashi and yô activity. 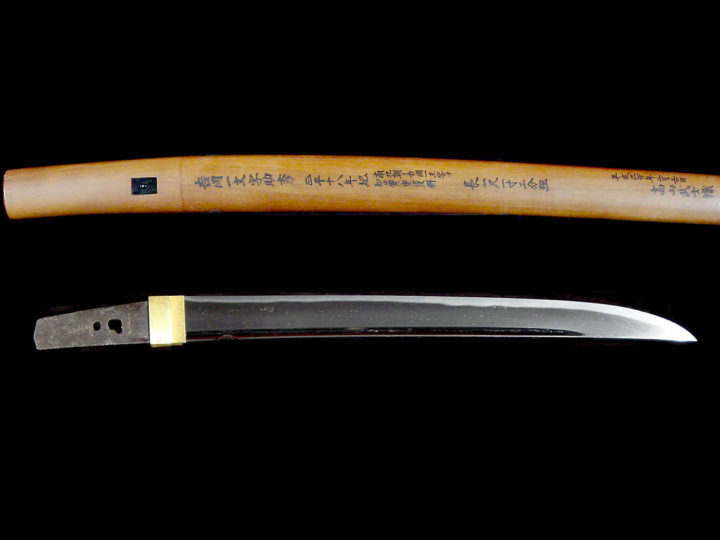 The nioiguchi is bright, all of which displays the excellence of workmanship in this one blade. Both the ji and ha are in the healthy condition of a masterpiece. hanayaka, shinʼnyo no tsuki ni kokoro omosumashite mitsuru yakumo naru kana. 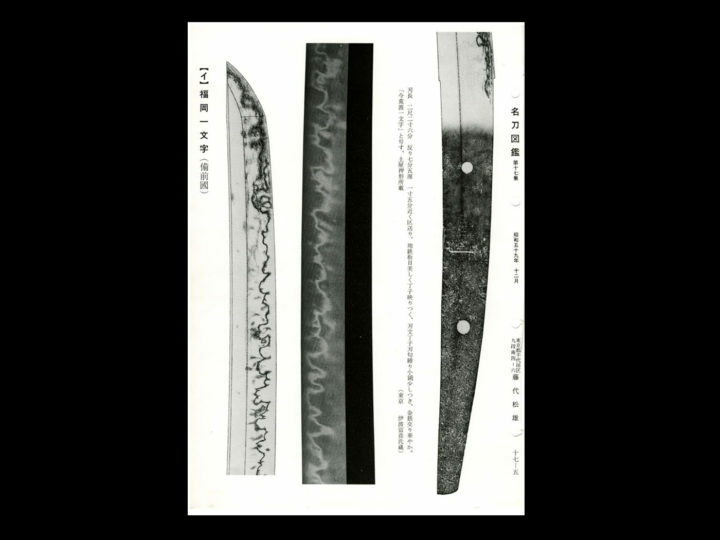 “Yakumo-Maru: Noted sword forged more than one thousand years ago by Yasutsuna from Hōki. 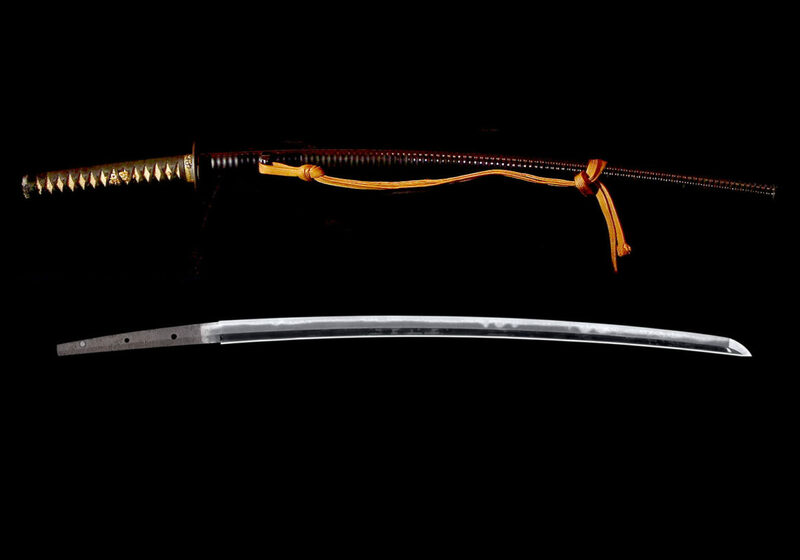 Although there are countless swords in the world, the Yakumo is particularly flamboyant and excellent. Apart from that, it was handed down as treasure sword since ancient times and does thus have no equal. The nickname Yakumo (lit. “stratus clouds”, a term deeply rooted in Japanese poetry) probably goes back to the flamboyance and clarity/shine of the blade. Note: This Gokuraku was apparently the owner of the sword and his flowery and somewhat overly and inaccurate attribution to Hôki Yasutsuna must, obviously, be taken with a large grain of salt, but it is interesting. Sayagaki is written by Honami Seizen for ordered by Gokuraku. Honami Seizen died around 1926. 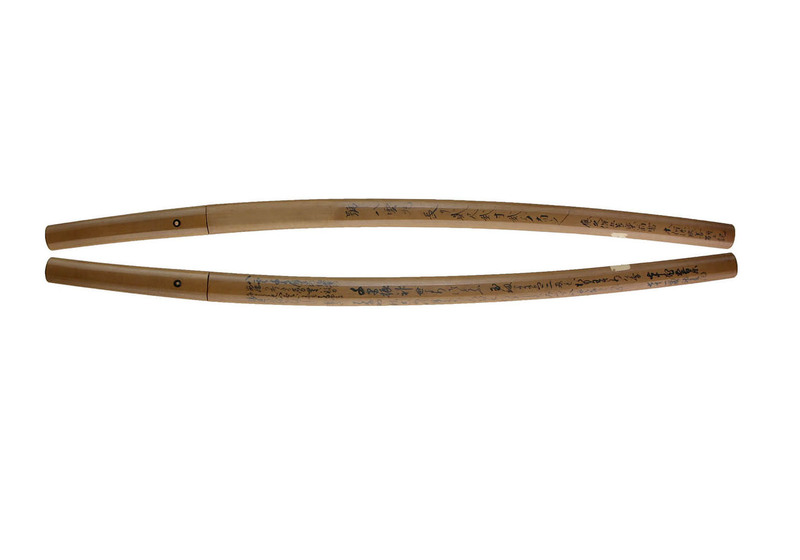 This sword is accompanied by a nice set of koshirae that its former owner used in the 1800’s as seen in the detailed photos below.